Let’s get this out of the way right off the bat. 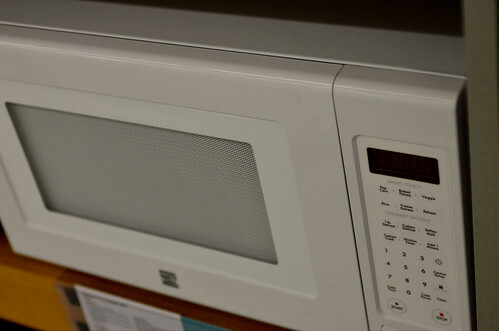 For the specific task microwaves excel at, they’re much more efficient than stove tops and ovens. The basic stats on energy use prove this to be the case. However, the savings are relatively small. Per comparable use (one hour in the oven versus fifteen minutes on the stovetop or in the microwave), you’re saving on the order of 1 to 1.5 kW by using the microwave – a savings of about $0.20 per hour of stovetop use, in other words. In truth, though, the savings are bigger than that. Let’s dig in a little deeper. The one task that microwaves really excel at is bringing water to a boil. They can do this much faster than virtually anything else in your home (except for perhaps a magnetic induction stove top, which is an incredibly expensive investment). I can bring a few cups of water to boil in our microwave in about two minutes. On our stovetop, it takes about eight to ten minutes to bring a similar amount to a boil. That’s a savings of six to eight minutes in the middle of meal preparation, which can make a quick meal really fast and a slower meal faster. It can get our family to the dinner table earlier and allows us to have more quality family time after supper. That’s a real value for us. Simply put, for every cup boiled in the microwave, it takes me about four minutes less time to do it than on the stovetop. It also saves approximately $0.03 doing it that way. This simple step is something that saves both time and money. Let’s say I’m going to boil some pasta on the stovetop. I get out a large microwave-safe bowl, fill it with a significant amount of water, and microwave it. The time to bring it to a boil or near-boil in the microwave is far lower than on the stovetop, so I’m actually boiling my pasta much faster by bringing the water to boil in the microwave. I’m also saving $0.05 or so by doing it this way. The same idea is true in almost any recipe that requires a hot or boiling liquid. It’s far more efficient to simply get cold water out of a tap or cold liquid from the refrigerator and boil it in the microwave than to use the stove top or oven. Typically, I don’t fully cook things in the microwave. Because they excel so well at one specific thing – raising liquids to a boil – they’re often poor at other things, such as properly cooking a dish of food. Thus, my usual technique is to bring the liquid to a boil in the microwave, then just transfer it to whatever I’m cooking in on the stove top or the oven. It’s a simple little thing, really. It’s never going to make you rich, but it does save a few cents. More importantly, it saves something else – a bit of time. Simple changes that save both time and money are valuable ones.